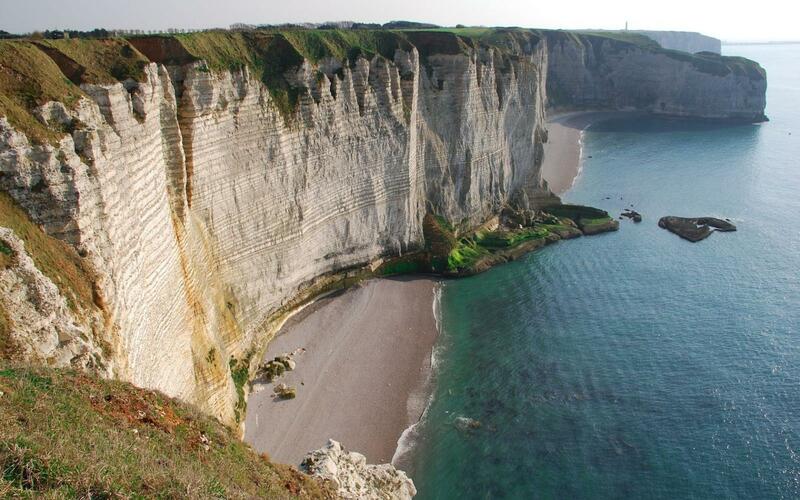 The astonishingly vertical cliffs of the Alabaster Coast are most picturesque in the small town of Etretat. The cliffs are up to 70m high and create a perfect contrast with the plateau of the Pays de Caux above the cliffs. Looking from the edge of the cliffs you will have an endless bird's-eye view of the coast. The pinnacle of the high vertical cliffs are the 3 arches carved out of the beautiful white limestone - Porte Amont, Manneport and Porte Aval that is complemented by a stalagmite-like needle rock of the same colour. 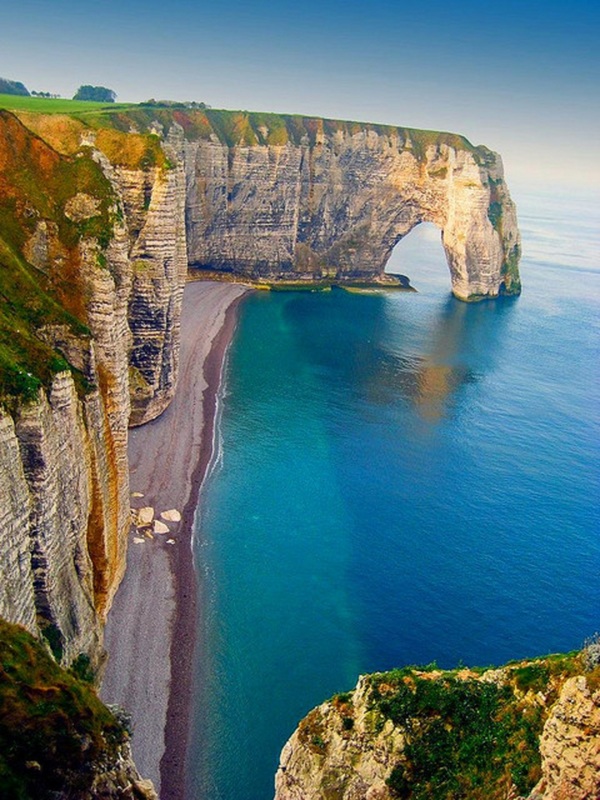 Interestingly, the natural arches were not created by the sea but by a long-gone river which ran parallel to the sea. After the river was gone, the sea has further shaped the arches. Made famous by numerous paintings by Claude Monet and other impressionists, the arches still look every bit as spectacular as at the end of the 19th century. By own car you can reach Eterat easily by D940. There are parking lots in many places rather close to the shore. All parkings are for pay and during high season it can be difficult to find parking place unless you come early in the morning. 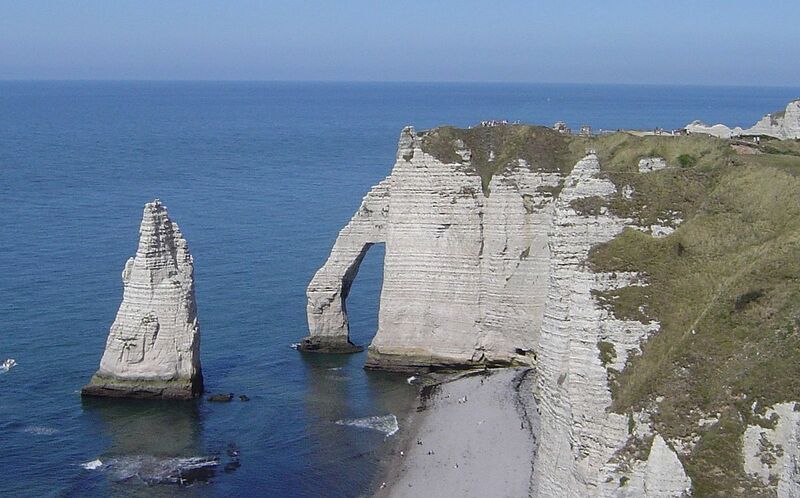 When using public transportation you can take train to Le Havre (228km from Paris) and then bus to Etretat. The buses leave right outside of the train station. Line 24 goes from Le Havre to Etretat and takes about an hour. In Eterat there is a path running along the coastline that offers a good view of the cliffs and arches.